Bimini, Bahamas is a tiny tropical paradise with stunning beauty and delightful sea creatures that are sure to mesmerize you. A Bimini honeymoon provides couples with a secluded Caribbean island that’s perfect for all types of getaways. There are so many wonderful destinations around the world, but sometimes the most romantic and fun ones are often overlooked. If you want a unique honeymoon destination, then consider Bimini. It’s made up of two islands in the Bahamas and is a convenient location for many visitors, since it’s right off the coast of Florida. However, it still remains one of the best-kept secret honeymoon destinations. Its crystal clear blue waters will quickly have you itching to dive in or get your toes wet. The ocean is full of dolphins and exotic fish, so you can create an itinerary that is filled with adventure. 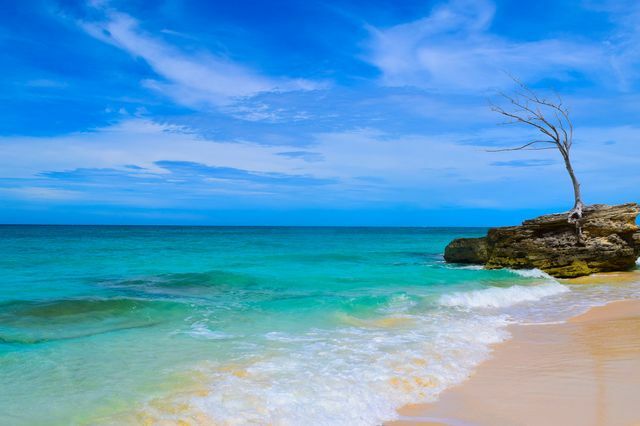 If you’d rather just relax and catch some sunshine, then Bimini is also a perfect place to find unpopulated beaches. Enjoy a midnight stroll on the beach with your partner and soak up every minute of your Bimini honeymoon! Start planning your Bimini honeymoon with this helpful guide. Thankfully the Bahamas get to enjoy about 320 sunny days, so you can take your Bimini honeymoon during any month. If you want to save money during your Bimini honeymoon, then avoid the high season from mid-December to mid-April. We also suggest booking early for certain holidays or events, like Christmas or Spring Break, because hotel prices can be high during those times. Relax on the Beach: Enjoy your time away from reality and just watch the waves tumble in at one of the island’s beaches. Sapona: This historical and interesting shipwreck sits partially above water and was used during the Prohibition. Scuba Dive: Discover what mysteries lie underneath the cool blue water during your Bimini honeymoon. Dolphin House: Explore the home of a local that’s made out of reclaimed tiles, coral, and shells. Healing Hole: Soak in the bubbling freshwater creek that claims to be filled with restorative minerals. Paddle Board: Grab a board and explore the ocean adventurously. Swim with Dolphins: Enjoy a once-in-a-lifetime experience with these intelligent creatures. Triangle Rocks: Explore the rocks if you want to catch a glimpse of some Caribbean sharks. Bimini Museum: Learn more about the history behind the islands. Try Conch Salad:Taste this delicious specialty famous in the Bahamas. Bimini Straw Market: Barter with the locals and take home a precious souvenir. Fountain of Youth: Even if you don’t believe in the myth, ask a local for the special tour. Snorkel: Swim among fish and look for stingrays, dolphins, and sharks.